Emily with Grandpa and their kitties. The cat playing with the mouse! 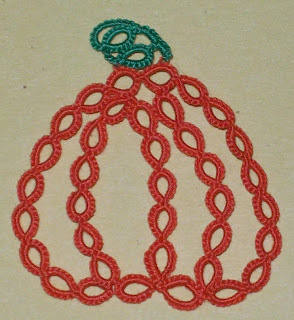 I decided to attach the pumpkins to a bookmark to make it easier to handle. 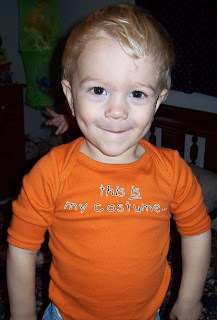 With it being the time for the annual costume party my brother and sister and I have been having for 9 years, I decided to show pictures of our costumes for past Halloweens. The first year, I was Tigger, the next I was Snow White. The 3rd, I was a pirate. I have pictures of them somewhere, but we didn't have a digital camera, so I'm not sure where they are! Okay, I got a picture of me as a pirate! The girls are cows and Dan & I are the farmers. Side view to show the duck better! I designed the duck and egg costumes. Here is the latest picture of all the kids together. Another shot of Andrew (2 months) with Peter (3½ months). I'm sure there will be LOTS of these types of shots coming in the future! Andrew checking out what Mommy is doing. I laid Andrew on our bed and William crawled up next to him and pulled the blanket up over them. The quilt over them is one I made as a teenager using fabrics from my childhood. October is "Pastor Appreciation Month". We decided to recognize Pastor yesterday. Sarah and Emily giving them the pictures that they drew. William fell asleep under the picnic table in the nursery! Our family has been fighting the "cruds". Sarah seems to be having the hardest time shaking it. It may be because she's in school now and that in itself tires her out. Here is Sarah after she crawled up onto the couch and fell asleep. She seems to be better now, finally! These are a couple pictures Dan took of a dragonfly that was flying around at our family reunion this summer that I never posted! Our church wanted to get some puppets for the Youth Group to use for skits. They would cost about $40 each, so we decided that I could sew them for cheaper. I had a pattern, but I changed it quite a bit to make it the way I wanted! This is the puppet that I sewed as an example of what they would look like. This puppet has felt eyes. All finished, showing the inside of the mouth. We named this one Bella. My mom and I (and the kids) went to buy the fabric for the puppets 2 days before Andrew was born. We couldn't find what we were looking for and it took quite a while to figure out something that would work. We ended up buying fabric to make 6 puppets. There will be a girl and a boy in 3 different skin tones- light, medium, and dark. Here is the light-skinned boy. I have the girl mostly done, but needed to put it aside to work on costumes and etc for October! The kids watching the skit. For the last couple of months, my mom and I have been working on getting shirts ready for "Membership Night" for Olympians at church. Once the kids complete the requirements for being a member, they get a t-shirt with the name of our church and a patch with their group name on it. I did the names and Mom did the patches. The leaders have blue shirts and the kids have red. My mom is the nursery leader, so we decided to give them a group name, also. The green shirt is hers and the yellow are the nursery aged kids. Close up of shirts. My girls have red shirts and the boys have yellow shirts. Andrew is 2 Months Old!